Spirit of Christmas in Prague is best experienced in the city's famous Christmas markets. You will see both locals and visitors mingling and laughing. We invite you to join them and have a sip of tasty mulled wine and a bite of traditional Czech delicacies. Trdelnik, a cinnamon spiced hot sugar coated pastry, will surely draw your attention, as well as Pernik, Czech style gingerbread. Do not forget Pilsner Urquell, Budweiser and Kozel. These are world-class quality beers made in Czech Republic, and you can try these, and many others, while walking down the Christmas market stalls. 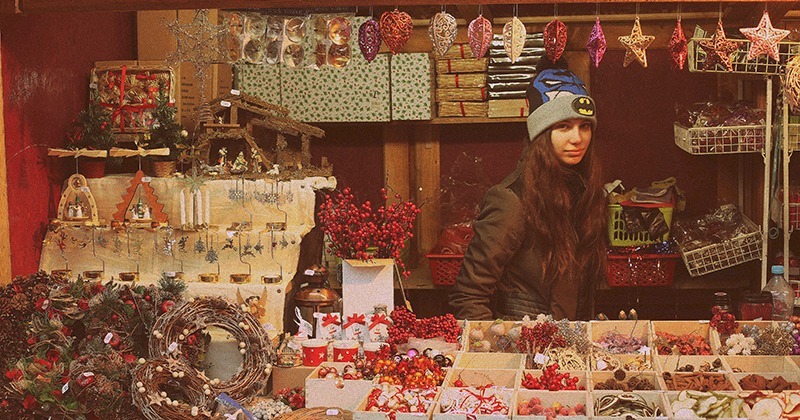 Christmas market in Namesti Miru is one of the best know markets in Prague. It is located in a hip and architecturally diverse neighborhood called Vinohrady. The market is known for being a place where mostly locals come and to have a chat with their neighbors. It is located in Namesti Miru, a green square in dominated by a breathtaking neo-Gothic Church of St. Ludmila, built in 1892. You can visit the stalls from 20 November to 24 December, from 10am to 7pm. Jiřího z Poděbrad is another another large green public space with an interesting Christmas market. Jiřího z Poděbrad's market is a regular farmers' market, very popular in Vinohrady neighborhood. It is open every Wednesday, Friday and Saturday. The locals love it for a wide range of fresh fruits and vegetables, honey and vegetarian food, among other products. The market becomes a beautiful holiday festival during Christmas time. Both adults and children can enjoy live music and take part in various workshops to create something authentic. In addition to the market, the square hosts a large Church of the Most Sacred Heart of Our Lord.